The Apple iPhone 8 and 8 Plus were launched on September 12, 2017. The phones were expected to be launched for a long time and Apple has also been teasing the audience with a lot of rumours and leaks. The first iPhone was released around nine years ago. Therefore, these phones will be unveiled on the tenth anniversary of iPhone, and that's why the expectations of users were very high. All the ruomurs, leaks and expectation were put to silence in the special Apple Event at the Steve Jobs theatre, where Apple launched three phones - the iPhone 8, iPhone 8 Plus and the iPhone X. The iPhone 8 Plus is the larger version of the iPHone 8 with better features and configuration. Let's take a look into the details of the next premium from the smartphones giant. The iPhone has been designed with a lot of care, thought and precision. The phone measures 158.4 mm x 78.1 mm x 7.5 mm in dimensions and weighs 202 grams. This much weight seems a lot, compared to many other deivces in the market, especially the Android devices. Just like the iPhone 8, the iPhone 8 Plus has larger physical button for easier access. 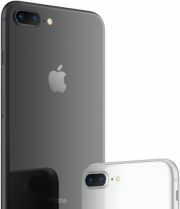 The back panel resembles the iPhone 8, fairly blank with the Apple logo at the centre and the camera module in the top left corner. The phone's front panel has a 5.5" IPS LCD display panel, dubbed as the Retina display by the company, the TouchID sensor, and the front camera beside the phone speaker grill. Bottom panel has the stereo loudspeaker and the charging port. Apple hasn't turned the port into the USB-C yet, much to the relief of older iPhone users. The panel has 1920 x 1080-pixel resolution at 401 ppi. The contrast ratio of the display panel is around 1300:1. Features such as the True Tone display, a Wide color display (P3) etc. are common to both the iPhones. The iPhone 8 Plus also has a feature unique to the iPhones - the 3D Touch. The typical brightness of 625 cd/m2, happens to be the same as that of iPhone 8. Also, Fingerprint-resistant oleophobic coating has been given to prevent any screen blotches. Apple iPhone 8 Plus "Gaming Performance"
The company keeps developing better and better hardware to pu tin their phones with every new genreation of iPhones rolling out. The iPhone 8 Plus has the A11 bionic chipset installed to offer a power-packed performance that will leave all other flagship phones far behind. The chipset runs on a 64-bit architecture and will be the best in the industry, according to Apple. The phone will have 3GB of RAM and will have 64GB/256GB storage space. The storage will be non-expandable and there will be only one SIM slot to accept a nano-SIM. Under the hood, the iPhone 8 Plus will run the iOS 11. The latest operating system from Apple Inc. has the best features in the industry. An intuitive UI, a quicktype keyboard for super fluid typing, an all new AR support has been added to the OS. The control center feature has been redesigned to control household equipment more easily and efficiently. The configuration also has improved the support for their AI assistant, Siri. A new and highly important feature has also been included this time - intelligent suggestions in Messages, Mail, QuickType etc. The iPhone 8 has been given a dual-camera setup, however it is not vertical, as rumoured. The 12MP+12MP (28mm, f/1.8 lens w/ OIS & 56mm, f/2.8 lens w/o OIS) camera is capable of taking super sharp and highly detailed photos, in a close-up as well as from a distance. The camera support PDAF, 2X optical zoom and a quad-LED (dual-tone) flash. The rear camera can take simultaneous 4K video and 8MP images and also has other commmon features such as geotagging, touch-to-focus, face detection, smile detection, HDR/HDR+ (photo/panorama) etc. The front camera has a resolving power of 7MP and has an f/2.2, 32mm lens that can capture beautiful selfies in the auto as well as portrait mode. The front camera can take sharp and focussed photos as well. The phone's camera can take videos at 2160p resolutions @ 24/30/60 fps and can capture 1080p images @ 30/60/120/240 fps. The phone supports slow-mo and super slow-mo modes at ful hd resolution. Multimedia options for the iPhone 8 Plus iclude a support for a very wide range of audio formats such as AAC, MP3, LPCM, Apple Lossless, FLAC, Dolby Digital, AAX, AAX+, WMV, WAV etc. Video playback can be done in the following formats - HEVC, H.264, Mp4, Motion JPEG (with Dolby Vision Support) and HDR10 content. 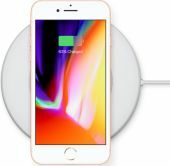 Apple iPhone 8 Plus "Wireless Charging"
Although Apple claims to have installed a bigger, more efficient battery the talk time ratings clearly show that the battery would not be as efiicient as the industry standard goes and would barely last through the day. The company claims Up to 21 hours of talk time on all networks and 60 hours of audio playback time. THe battery would however be turbo-charge supportive and can charge to phone to 50% levels with just 30 minutes of charge.Apart from that, the phone will alo be wirlessly chargeable using Qi chargers. The phone be connective to all 4G LTE/VoLTE, 3G HSPA/UMTS and 2G EDGE/GPRS cellular networks. Other wireless connectivity options include a support for Assisted GPS, GLONASS, Galileo, and QZSS, Bluetooth v5.0, NFC(only Apple pay). The list of sensors includes a Touch ID fingerprint sensor, Barometer, digital compass, Three-axis gyro, Accelerometer, Proximity sensor, Ambient light sensor and a backside illumination sensor. The iPhone 8 Plus is a superb device meant to deliver the best performance in its class. But even that is not spared from having some drawbacks. How many color variants is the phone available in? The phone has been launched in three color variants - Silver, gold and space grey. What kind of display can be expected in the upcoming iPhone 8 Plus? The iPhone 8 Plus has a 5.5 inch Retina Display with IPS technology. Is the display protected by a toughened glass? Yes, the display is protected by an ion strengthened glass with oleophobic coating and sapphire crystal glass. Is the primary camera backed by optical image stabilization? Yes, the primary camera has 3-axis optical image stabilization. What is present in the iPhone 8 Plus? The iPhone 8 Plus has a hexa-core A11 bionic chipset built on 64-bit architecture. Which Operating System does the iPhone 8 Plus run on? The phone runs iOS 11 using the company’s own Apple File System (APFS). Can you tell anything about the battery? The device is powered by a non-user removable Li-Ion battery. The battery of the phone offers talk time upto 21 hours and music playback of up to 60 hours. What connectivity options does the phone have? The connectivity options include Wi-Fi 802.11ac, dual-band, hotspot, Bluetooth version 4.2, A2DP, LE, A-GPS, GLONASS, NFC (Apple Pay only), reversible lightning connector (for wired connectivity). Does the phone provide NFC support? Yes, the phone has NFC, but for Apple Pay only. How much internal storage does the phone come with? Would we be able to expand the internal storage of the phone? The phone has been launched in two storage variants 64GB & 256GB. None of them have any expansion option. How much RAM does iPhone 8 Plus have? The iPhone 8 Plus has 3GB of RAM. Does the phone support 4G/LTE networks? Yes, the phone supports 4G/LTE networks. What kind of cameras are present in the iPhone 8 Plus? The iPhone 8 Plus has a horizontally aligned dual camera setup on the rear and a single-lens 7MP camera on the front. Does the phone provide FM Radio support? No, there is no FM radio in the iPhone 8 Plus. Does the phone provide support for Wireless charging? Yes, the phone can be charged with Qi chargers.